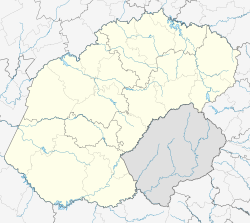 Winburg is a small mixed farming town in the Free State province of South Africa. 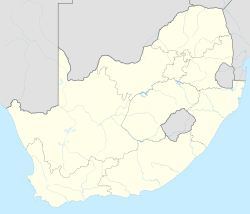 It is the oldest proclaimed town (1837) in the Orange Free State, South Africa and thus along with Griquatown, one of the oldest settlements in South Africa located north of the Orange River. Winburg is situated midway between the Orange River and the Vaal River, adjacent to the N1 National Road and the N5 road National Road which links Cape Town to Johannesburg and Durban via N5 National Road to the N3 National Road respectively. The nearest city, Bloemfontein, is 120 km away. When the Voortrekkers reached the area of Winburg, there were no other tribes or inhabitants. The nearest community was that of a Tswana tribe under Chief Makwana at Thaba Nchu, 60 km south east of the town and the Basotho tribes in the mountains of the current Lesotho, 100 km east of the town. The trade of cattle for land between the Vaal and Vet Rivers, undertaken by Andries Pretorius and the Bataung Chief Makwana in 1836, led to the settlement of a dispute between the African tribes. The Voortrekkers offered protection for Chief Makwana from the Tswana tribes, against the Basotho tribes habouring in the mountains of the current Lesotho and stealing the cattle of the Bataung tribe. In exchange for continued protection, the Voortrekkers were offered the land between the Vet and Vaal Rivers. The Voortrekker leaders had a small disagreement as to where to establish a town. A vote was held under the Burgers and Andries Pretorius's group won and elected to establish the town in its current position and to call it Winburg, after the Dutch word winnen (to win). Winburg acted as a settlement and religious centre for Voortrekkers. Winburg was originally selected as the site for the main Voortrekker Monument, but Pretoria won favour and a five-tiered secondary Voortrekker monument was built on the outskirts of Winburg instead in the 1950s. It carries the names of the Voortrekker leaders: Piet Uys, Andries Hendrik Potgieter, Andries Pretorius, Piet Retief and Gerrit Maritz. The lengths of the five tiers are proportional to the distances travelled by the respective settler groups. The monument is built near the site of the birth-house of Martinus Theunis Steyn, who was president of the Boer Republic of the Orange Free State. The town was the site of a concentration camp for women and children captured by the British Army during their scorched earth campaign during the Second Boer War. 355 children and 132 adults died in this camp due to malnutrition and contagious diseases, while kept in tents without any infrastructure or protection during the bitter cold winters of 1899 – 1901. The famous Boer General Koos de la Rey was born in the district of Winburg on the farm Doornfontein. General De La Rey was the leading Boer General of the Western Transvaal in 1899 – 1901. Winburg had a black armed commando supporting the British soldiers during the war of 1899 – 1901. The first shots of the Maritz Rebellion in 1914, against the government's involvement in South West Africa, were fired in the district of Winburg. The first President of the Republic of South Africa, when it gained independence from the United Kingdom in 1961, was Charles Robberts Swart, who was born and went to school in Winburg. The white community of Winburg is famous for the differences in political heritage. The town was divided into two camps, due to their support to either the South African Party of General Jan Smuts, or the National Party of Dr Daniel François Malan. 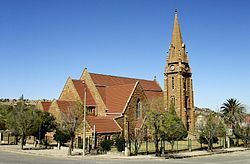 This led to the division of the Dutch Reformed Church into two separate congregations, Klip Kerk (Stone Church, because it was built from sandstone) and which was the original church for the Dutch Reformed Church and Rietfontein Kerk. Bitter feuds were fought between supporters of the two parties. The Klipkerk supporters demolished the Rietfontein Church project several times. In later years this division was almost erased. The National Party's support and later abdication to the African National Congress, led to a new division in the community. Old feuds were re-ignited and with the town divided along religious lines again, a new church, the Afrikaans Protestant Church, was formed. The communities in Winburg, as in most South African towns, still lead segregated lives, a remnant of apartheid days. Social interaction between different population groups is being encouraged by an official integration policy of the African National Congress government. However this has led to the deteriorations of many facilities in Winburg, of which the previous prestigious school and orphanage, are two examples. The town's economy is dwindling and it is just a ghost town to what it was before 1994. Winburg was a very neat town, known for its good school, concrete streets, sandstone church, orphanage, fully equipped hospital, many professional inhabitants and businesses, agricultural co-operations, yogurt milk and butter factories, good community health services, social support structures, quality sport and recreational facilities, caravan park, hotels and Rietfontein water reservoir in the Laaispruit and the Voortrekker Monument and museum. The current state of maintenance of these facilities is evident to every tourist: The museum and monument are deteriorating and no plan is envisaged to save them for future generations. The majority of the people are solely financially supported by the government grants funded by the taxpayer for the poor. There are only full time employment opportunities for about 2% of the people. The ANC government did no investment into rural towns to create employment opportunities since 1994. Wikimedia Commons has media related to Winburg. ^ a b c d Sum of the Main Places Winburg and Makeleketle from Census 2011. ^ "President MT Steyn". Anglo-Boer War Museum. ^ "Concentration Camps". Anglo-Boer War Museum. ^ "General Jacobus Hercules de la Rey". Anglo-Boer War Museum.